It’s easy and fun to create a wedding present that’s practical, thoughtful, and memorable. It’s wedding season! Which means, unless you’re the one walking down the aisle… it’s time to start walking the aisles of your local store in search of the perfect wedding shower or wedding gift. Sure, you could browse the registry and grab a few sets of the bath towels… or, you could embrace independent, creative thought with your gift. How about a cookbook that celebrates food, love, and your memories with the happy couple, and is easily customized for the next wedding you attend? Wedding gift registries always start in the kitchen — I know mine did. My now-husband and I went ham with a scanner at a special Crate & Barrel registry event, zapping everything from wooden spoons and placemats to a food processor and the toaster oven I’d been craving for years (no, really). It’s a good thing, too: a recent study (sponsored by Calphalon) found that 87 percent of couples believe cooking together strengthens their relationships. But like most couples, we never thought to register for cookbooks to help us use all that kitchen swag we’d so gleefully registered for. 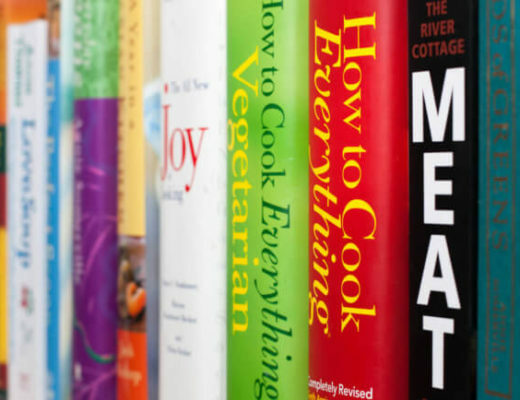 A DIY cookbook is truly the perfect gift. It’s not just a collection of recipes — it’s a culinary scrapbook that will remind the couple of you every time they open it to make a meal together. 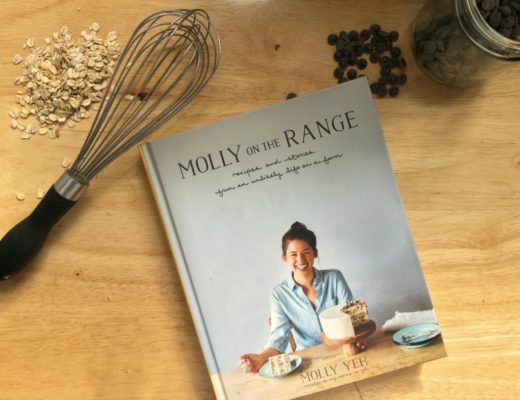 It’ll easily be the most thoughtful gift in the pile the night of the nuptials, plus personalized cookbooks are beautiful, useful, affordable (creating one on Cookbook Create starts at $35) and, yes, easy to make. 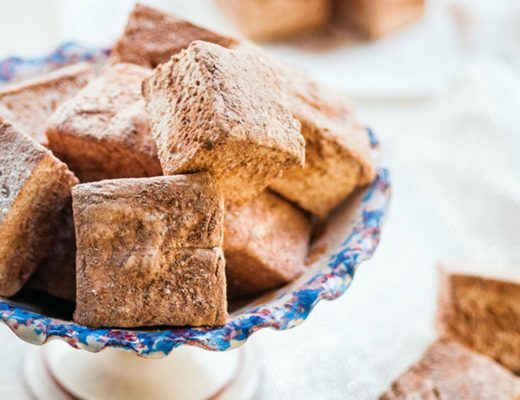 Once you’ve decided to create your DIY cookbook wedding gift, it’s time to choose a theme — this will tie the whole thing together and make the book feel more like a culinary scrapbook than simply a page-by-page list of recipes. Add a recipe from the sidebar on the left-hand side of your dashboard. 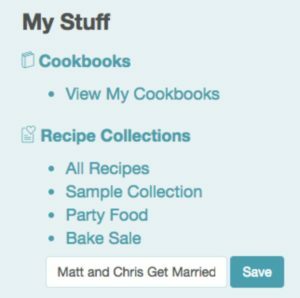 To create a collection, scroll through the same sidebar, and enter the name of your collection (think “Matt and Chris Get Married!”) underneath Recipe Collections. Once you’ve compiled all your recipes, you can start designing. From the left sidebar, click the “Create Cookbook” button, and begin the fun design process. As you design the book itself, you’ll have lots of opportunities to jazz up the cookbook with extra-personal touches: text boxes with your favorite memories of the couple, quotes about love, or tips for a happy marriage — or, you could add fun photos, like each member of the couple when they were kids. 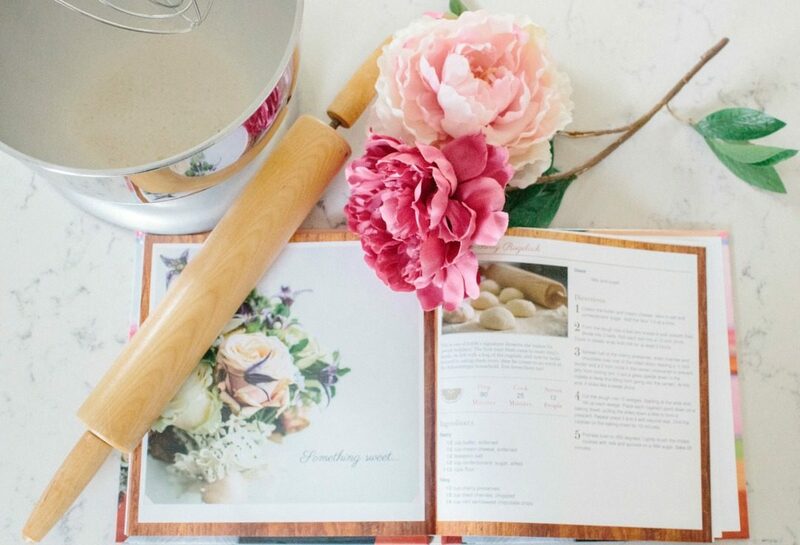 You can also collaborate with others — fellow bridesmaids, both partners’ families, college pals, and more — to create a group cookbook that’s from all of you. From your collection page, click the settings wheel located in the upper right-hand corner of the collections page. Set “Who can view this collection?” to Community so you can invite contributors. In the section titled “Invite contributors,” type the email address of the person you’re inviting and click the Invite button. You’ll get a notification that your invitation has been sent, and you’ll see them in the “Manage Contributors” section. 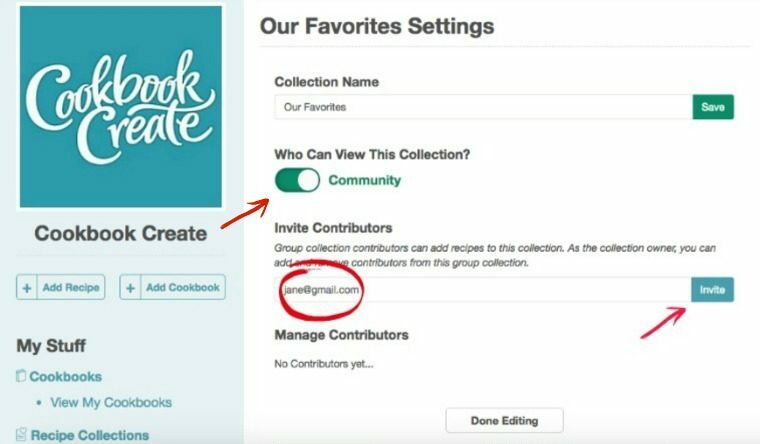 Your contributors will be able to add their recipes using the recipe entry form on Cookbook Create’s website — and be part of creating the best group wedding gift ever. Ready to give the best wedding gift ever? Create a personalized book now! Paige Worthy is a Chicago-based digital marketing strategist, writer, yoga instructor, and avid home chef. Visit her at paigeworthy.com. This is a really interesting idea, food is always a good option. Everyone likes a bit of DIY. We have our kitchen in a lantern roof orangery so its always bright we just need to fill it with items like this. Thanks! And what a wonderful idea!